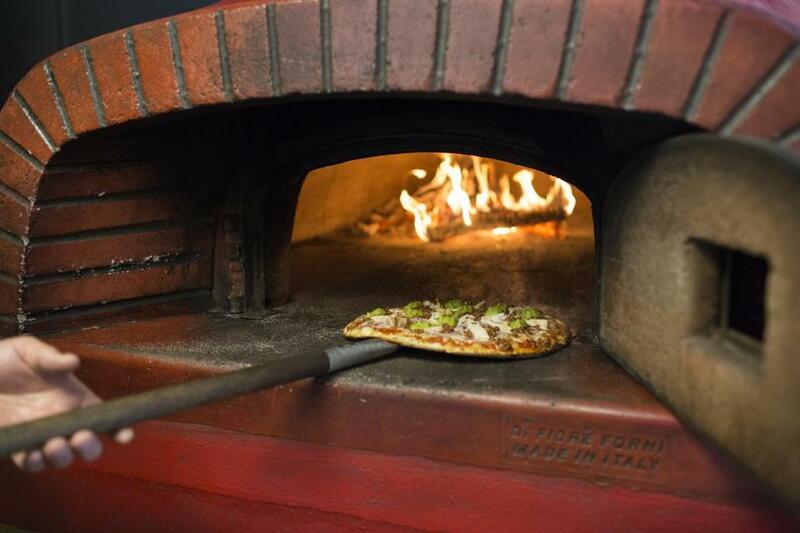 David Champeau flips a pizza in the oven at Kindles Pizzeria in Marlborough. IN THE KITCHEN “In the kitchen” is something of a relative term at Kindles Wood-Fired Pizzeria, because most of the magic happens in full view of the customers. 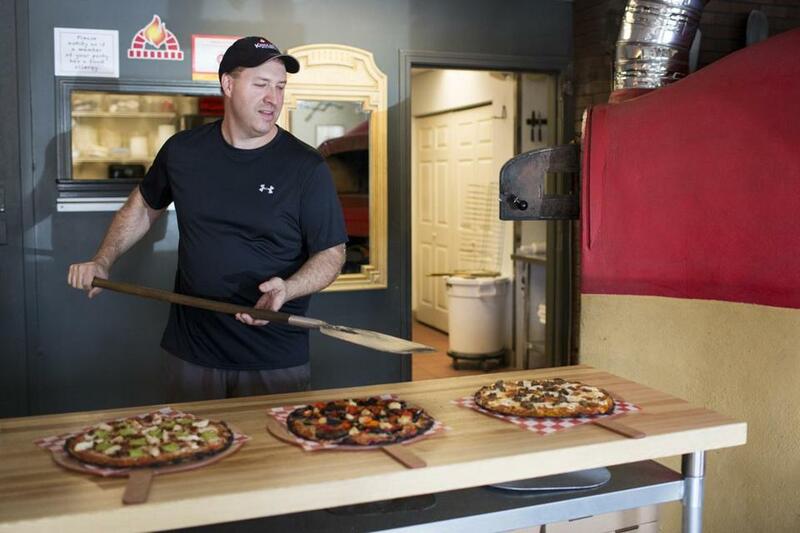 Owner David Champeau, who has worked in restaurants for more than 30 years and considers wood-fired pizza “timeless,” ordered an 80-inch-tall, 80-inch-round wood-fired pizza oven imported from near Naples, Italy, as the centerpiece of his new venture. “People eat with their eyes, but also with their nose,” said Champeau, who lives in Hudson, describing the scents emitted from the oven as “very primal.” The oven burns mainly red oak, white maple and birch woods. Express an interest in the cooking process, and Champeau will enthusiastically beckon you over to peer into the wood-burning aperture as he whisks pies in and out with a large palette. His invitation makes perfect sense: The name “Kindles” refers to the process of lighting and managing the oven (think kindling), but also to a desire to kindle personal connections with diners. THE LOCALE Kindles opened last summer on Boston Post Road East in Marlborough. Three picnic benches abut the parking lot, and there are 40 seats inside the comfortable, Italian-themed dining room where diners place orders at the counter and are served at their tables. The restaurant serves both eat-in and take-out customers; there is no delivery at this time. ON THE MENU Champeau had high aspirations when he started Kindles: “I wanted to make the Rolls-Royce of pizza,” he said. To maintain consistency, he only prepares one size of pizza, which is approximately 12 inches in diameter. He acknowledges his pizzas may not be cheap, but he believes the high-quality ingredients justify spending more dough. The size, he adds, encourages diners to try more than one type. Where to start? We made a beeline to the Truffle Honeypot ($18.99), or “the pizza of the gods” as Champeau puts it. The crust is layered with house-made red sauce, fresh mozzarella cheese and caramelized onions, then topped with tendrils of prosciutto, fig preserves and a drizzle of organic honey infused with real black truffles from France. The combination is dreamy, and the wood-fired oven confers a beautiful smokiness and char to the thin crust. The Roasted Garden ($14.99) is another winner. Eggplant is roasted, rather than breaded and fried, and nestled alongside full cloves of roasted garlic, red peppers and caramelized onions with red sauce and mozzarella cheese, with the wood-firing process really bringing out the intense flavors of the vegetables. If you’re still overwhelmed with choices, you might try Champeau’s favorite -- the aptly named My Favorite ($14.59), with meatball, ricotta cheese, extra pepperoni, extra Romano cheese, red sauce and a pinch of oregano. He also recommends the Smoky Pinocchio ($14.79), topped with roasted corn, chicken, applewood-smoked bacon, balsamic glaze, red sauce and mozzarella. And then, there’s the always-popular “plain” cheese ($9.99), which at Kindles is prepared with red sauce and Italian Pecorino Romano, mozzarella and provolone cheeses. Eyeing the menu, we’re inclined to also try the Aloha Mahalo ($14.99) with BBQ pork, ham, pineapple and a teriyaki glaze, and the Hot Diavolo ($15.29), featuring pepperoni and chopped cherry peppers drenched in chipotle honey, spicy chili-garlic sauce and buffalo sauce. Kindles Wood-Fire Pizzeria is at 10 Boston Post Road East in Marlborough; 508-251-0077, www.kindleswoodfiredpizzeria.com. Tuesday through Saturday, 11:30 a.m. to 9:30 p.m., Sunday, noon to 8 p.m., closed Monday. David Champeau at Kindles Pizzeria in Marlborough. Rachel Lebeaux can be reached at rachel_lebeaux@yahoo.com or on Twitter @rachjournalist.